As the holiday season approaches, your task list may begin to overwhelm you. There are office parties, social engagements, gift buying, children’s recitals, holiday meals, travel, and financial decisions — all tapping on your shoulder and demanding attention. Where do you begin? While slowing down and adhering to a schedule may be two tactics to help deal with life’s pressures, Cass and Walker agree that, as holiday stress and anxiety mount, the following calming remedies may also help you center yourself in the eye of this seasonal storm. Of course, it’s crucial you consult your physician before adding any of these products to your regimen. Kava kava (Piper methysticum) can be accurately described by simply translating its Latin name, which means intoxicating pepper. Unique to the South Pacific, kava kava has long been used by native islanders to induce calm, relaxation, and sleep. This botanical — most effective in whole plant form — works on the muscles directly, as well as on the limbic system’s amygdala complex, considered the emotional command center of the brain. Contraindications include pregnancy and nursing, Parkinson’s disease, and antianxiety drugs. Because of the sedative effects in high doses, exercise caution when driving or operating heavy machinery. Recommended dose: 100-250 mg one to two times daily, standardized to 30 percent kavalactones per dose. Valerian (Valeriana officinalis) is “nature’s Valium,” Cass says. This folk remedy is another effective antianxiety herb that enjoys great popularity in Europe. The components in valerian have a sedative effect on the central nervous system by enhancing gamma-aminobutyric acid (GABA) activity. GABA is a calming amino acid and neurotransmitter that induces relaxation, lifts spirits, and slows heart rate. Valerian comes with few cautions. However, Cass notes, those taking certain drugs should only use valerian under a practitioner’s supervision. “Valerian can interact with alcohol and certain antihistamines, muscle relaxants, psychotropic drugs, and narcotics,” she says. Recommended dose: 200 mg four times a day, standardized to between 0.8 percent and 1 percent valerenic acids per dose. St. John’s wort (Hypericum perforatum) has had its share of publicity in recent years, first being heralded as a panacea for depression, then denigrated to hoax when used to cure severe cases. The data reveal, in fact, that this tried-and-true herb amplifies the response to serotonin and is thus effective for both mild to moderate depression and anxiety. Three studies revealed that St. John’s wort mimicked commonly prescribed antidepressants — such as Luvox, Paxil, Prozac, and Zoloft — alleviating depression-related anxiety and insomnia. St. John’s wort is contraindicated during pregnancy and lactation and should not be taken by those on blood thinning, antianxiety, or antidepressant drugs. This herb may also inhibit the efficacy of birth control pills. Recommended dose: 300 mg three times a day, standardized to 0.3 percent to 0.5 percent hypericin and/or 3 percent to 5 percent hyperforin per dose. May take four to six weeks before results are evident. GABA, mentioned above as a component in valerian, controls the release of dopamine for a calming effect. “GABA helps shift a tense, worried state to relaxation,” Cass says. GABA can easily cross from the bloodstream into the brain, ensuring its efficacy, she explains. Don’t use GABA with alcohol or sedative drugs, including muscle relaxants and antihistamines, because it could exaggerate the effects. Recommended dose: 50-100 mg three times a day. Inositol, included in B-complex vitamins, is a natural isomer of glucose and is gaining popularity as an antianxiety remedy. In one study, subjects taking inositol reduced the number of panic attacks by four a week, while those taking the prescription drug Fluvoxamine experienced a reduction of 2.4 attacks. Cass says several B vitamins influence emotional health, including vitamins B6 (pyridoxine) and B12 (cyanocobalamin), as well as folate, and should be taken in combination. Recommended dose: 100-500 mg a day. Exercise has time and again proven its ability to effectively reduce anxiety. Here’s why: In cases of chronic panic and anxiety, the hormone cortisol is continually released and blood sugar levels take a nose dive, resulting in even more anxiety, fatigue, and mood swings. Exercise counteracts this by reducing cortisol levels and balancing blood sugar levels. Massage releases endorphins, the body’s natural feel-good chemical, which can ease anxiety and stress. And by helping muscles truly relax, massage lowers blood pressure, increases deep sleep, reduces fatigue, and increases energy. Like yoga, massage can also induce a meditative state or heightened awareness of the present moment, manifesting in emotional and spiritual balance. Additional studies suggest meditation induces greater immunity, and other bodywork therapies such as tai chi appear to have similar benefits. Walker agrees: “Ingesting pesticides, chemicals, and food additives overwhelms the liver, then it can no longer efficiently clean the blood. This imbalance contributes to anxiety.” She also reveals one of her favorite tactics for inducing calm. “I recommend putting a few drops of Rescue Remedy in a bottle of water and drinking it throughout the day while at work,” she says. This combination of flower essences, likely the most popular of the Bach Flower remedies, includes star of Bethlehem, clematis, cherry plum, impatiens, and rock rose, and is used to ease stress, trauma, fear, and anxiety. In addition, both Cass and Walker acknowledge the importance of a good night’s sleep — think chamomile, skullcap, hops, passionflower, and lavender for nightcap teas. Natural remedies may be the key to breezing through this holiday season with the grace and ease you always include on your holiday wish list. This year, with a little natural help, you just might get them. By Lara Evans Bracciante is the online editor for Body Sense magazine. Consult with your primary care physician before adding any supplement to your healthcare routine. Dosage sources from Natural Therapeutics Pocket Guide, 2000-2001 (LexiComp, 2000) by James B. LaValle, D.L. Krinsky, et al. 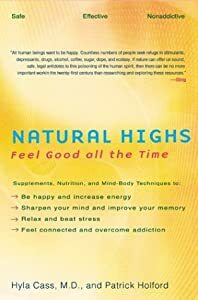 and Natural Highs: Feel Good All the Time (Avery, 2002) by Hyla Cass. Gallery | This entry was posted in Bach Flower Practitioner, Holistic Healing, Life Coaching, Massage, Massage Therapist, Massage Therapy, Our Center and tagged anxiety, GABA, Gamma-Aminobutyric acid, John, Kava, St John's wort, Valerian (herb), Valium. Bookmark the permalink.